Editor’s Note: motorleaf is raising $750k in seed funding on AgFunder. 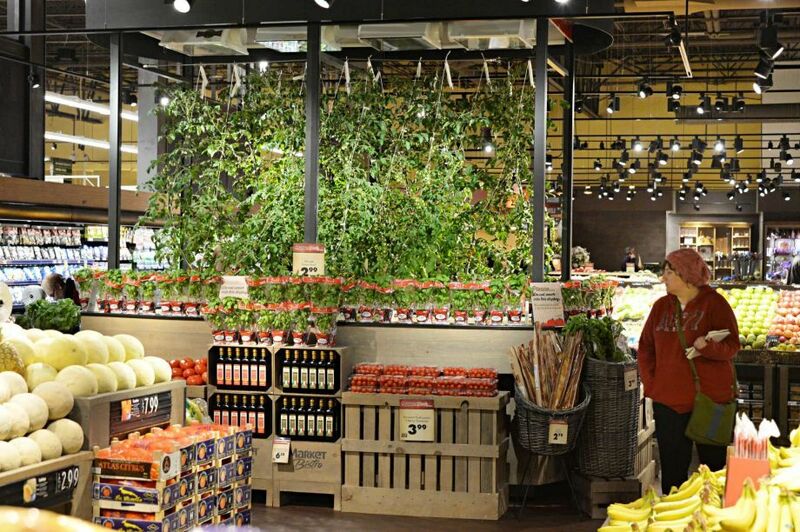 If you walk into the produce aisle at Price Chopper’s Market Bistro store in Latham, New York, you will be greeted with one of the first hydroponic tomato growing operations inside a grocery store. Installed in the store when it was built in 2014, the hydroponic display has developed quite a following from local consumers who keenly report back on the progress of the tomato plants to the operator, Vermont Hydroponic Produce. What they don’t realize is that Vermont Hydroponic Produce has a clear view of this operation without having to step foot into the store, because the operation is being monitored, and automated, by a technology platform developed by Canadian startup motorleaf. Motorleaf has built a smart and automated indoor farming operating system, consisting of hardware devices and software analytics, to enable growers to capture data about their crops, learn what the crops need, and instruct existing equipment to answer those needs. Price Chopper is using motorleaf’s HEART device, which collects air temperature, humidity, and lighting level data, and feeds into motorleaf’s intuitive software. The HEART device then connects to an operation’s lighting hardware and feeder pumps to start automating their use. Growers can receive custom alerts to any mobile device to find out about the changing conditions of their farm and can even connect webcams into the HEART so they can view the farm in real-time. The HEART, one of 4 hardware units. Plug it in and it starts collecting Air Temp, Humidity, & Light Level data. Connect any lighting hardware, and feeder pump and start automating their operation in seconds. The HEART is the central hub of the motorleaf system, and can connect with up to 250 pieces of equipment. motorleaf has also developed another three pieces of hardware that can connect into the system and perform other tasks. The DROPLET connects to an operation’s water reservoir and collects essential information about water, PH, and nutrient levels, as well as temperature in the reservoir, and sends that data to the HEART. The DRIPLET enables growers to automate the delivery of PH and nutrients into the water supply based on a timer or conditions on the farm. Lastly, the POWERLEAF unit can control other equipment such as air conditioners and heaters, and can be instructed by the HEART to turn them off based on timers or sensor readings from the HEART and the DROPLET. 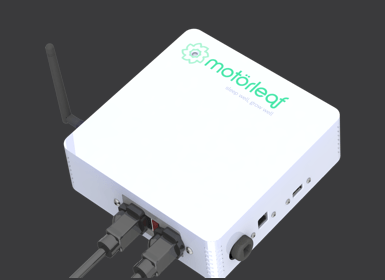 Motorleaf has the added benefit of continuing to collect data and automate operations even if an internet connection is lost, because the HEART acts as the main controller and router, sending out a signal to anything in range — about 90 meters — using low-frequency radio. This 99% of guaranteed uptime is just one of the things setting motorleaf apart from other indoor grow solutions on the market. It also uses industrial quality sensors and probes, both local and cloud-stored data, multiple log-in and access profiles with a view only feature, motion detection with any webcam, and machine learning algorithms. The motorleaf system can be used in any type of indoor farming operation from greenhouses through to warehouses and at any size. IBISWorld estimates that hydroponic growing equipment purchased in stores is already valued at $645 million, and with global hydroponic produce valued at $17.7 billion by Manifest Mind, and US legal cannabis at $5.7 billion, motorleaf has plenty of potential customers. Motorleaf receives 40,000 data points per customer per week and therefore can start predicting a crop’s needs, solving potential problems before they exist. Also, the startup plans to use its network of data and growers to connect users to each other – on an opt-in basis – to share data, plant recipes and knowledge. Ramen Dutta, the inventor of motorleaf, started building the first prototype after trying to find a solution flexible enough to control and automate his own gardens. Dutta graduated from McGill University with a degree in agriculture engineering. Instead of pursuing a career in agriculture, he went into IT and launched his own company, RamComputing Services, but continued to pursue his passion for agriculture by running a small indoor hobby farm. After several months of hacking and improving his prototype and realizing that other growers in his area also wanted such a solution, he joined forces with Ally Monk, now CEO of motorleaf. Monk has a background in business and product development for technology, including roles at eFundraising.com, which was sold to Readers Digest for $27 million, OneBigPlanet, where he helped to raise $3 million in venture capital, and MemberBenefits Inc, which was acquired by Brook Ventures. “The demands of Ramen’s IT business meant that he didn’t want to constantly go back and forth to his operation to test PH and nutrient levels, so he looked for an off-the-shelf solution that could turn his garden into a smart garden — like a ‘Nest’ for ag — and he couldn’t find anything on the market,” says Monk. “So he started hacking together what we eventually called the HUB — for Huge Ugly Box — which was giant but started to offer the solutions he wanted.” The company has since reduced the size of this box significantly in an elegant and functional design. Local growers instantly showed interest in the system, pushing Dutta and Monk to focus full-time on the business and they won a place in the Founders Fuel accelerator program, one of Canada’s leading accelerators, where the theme was artificial intelligence. This accelerator is funded by Real Ventures, which has now invested in motorleaf. Now the technology is market ready and without any cash spent on marketing, motorleaf has over 200 units on order from a range of customers including OEM manufacturers, supermarkets, high schools and licensed cannabis farmers. motorleaf is now raising $750k in seed funding on AgFunder to manufacture and market its technology at scale and build out the motorleaf team. View the profile here and email [email protected] to connect with the company.